(CNN) -- The reminders are everywhere: Wash your hands. Use hand sanitizers. Stay away from class if you're sick. 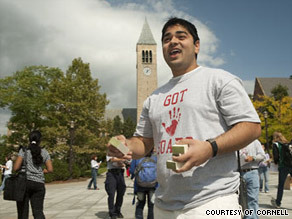 Cornell student Vishnu Patel wears a "Got Soap" shirt as he spreads awareness about the flu. College students said they're reminded nearly daily about flu prevention by e-mail updates, posters and ubiquitous hand sanitizer dispensers around campus. Yet, despite the pervasive prevention messages, many students said they're not too worried. Those who have been sick said it was no different than the seasonal flu. "Students are going about their business as normal," said Dr. James Turner, the executive director of the department of student health at the University of Virginia. "They're asking, 'What's the big deal?' Some of them are aggravated. Those that are sick report feeling miserable. They recover uneventfully and go on. There's more anxiety among parents and staff trying to respond on campus to various needs." Since August, 13,434 cases of the flu have been reported by the 253 schools contributing data to the American College Health Association. Of the cases, there have been 21 hospitalizations. This data do not include all U.S. universities. "There's plenty of opportunity to spread infections," said Turner, who is also president of the association. He noted that students "tend to socialize in large groups, frats, bars, sharing the drinking glasses, smoking material. They're in real close contact, densely packed into parties which are all breeding grounds for infections." Two student deaths related to the flu have been reported this school year. Andrew Salter, a freshman at Troy University in Troy, Alabama, died on September 5. The student had the flu, possibly H1N1, before he was hospitalized for pneumonia, according to a university spokesman. Six days later, Cornell University student Warren J. Schor, 20, died of complications related to H1N1 flu, according to a statement released by the Ithaca, New York, university. Since school started in mid to late August, the Southeast had a high rate of H1N1 infection, but those rates are dwindling, while in other areas the rates are increasing, Turner said. "We're seeing increasing rates in the Midwest and mid-Atlantic areas," he said. "This has to do with when schools start classes... We're going to see regional outbreaks, timed around when classes are reconvening." When David Accame returned for his sophomore year at the University of Maryland, College Park, he wasn't worried about H1N1. "There's always the risk of sickness when you're around so many people in close quarters," said Accame, who lives in the dorms. "I didn't think anything of it more than a regular cold." Then in early September, Accame came down with a headache, stuffy nose, cough, sore throat and a 103-degree fever. After taking Tamiflu, Accame recovered in a few days. His illness sparked some anxiety among his roommates. "Both my roommates sprayed down everything. They sprayed my bed with Lysol, all the silverware, desk, everywhere," he said. Other than the brief illness, Accame said "this school year has been the same as the last." Some have opted for a humorous approach, forming Facebook groups such as "not living on campus and as a result, not having swine flu" and "We hate swine flu affected students." Michelle Zeng, a Cornell senior, said, "I definitely wash my hands more often and try to get more rest than usual to help my immunity more. I still go to class. My regular daily routine, I don't think it changed that much." Angelica Geter, a graduate student at Emory University in Atlanta, Georgia, noted that people get tense when a classmate coughs nearby. "Everyone says, 'Are you feeling OK? Have you been to the doctor?'" Emory formed a voluntary isolation unit for students who become ill. Since the unit opened, 131 students have checked into the dorm, and as of last Friday, all had checked out, according to a university spokeswoman. Earlier this month, Dan Tapiero, an Emory sophomore, was kicked out by his three roommates when he got sick. "They were polite about it," he said. He stayed at the isolation unit for four days doing homework, surfing the Web and catching up with classes. Having the H1N1 flu wasn't terrible despite the forced exile, he said. "It's like the regular flu. You feel sick for one or two days," Tapiero said. "I felt like the media was using scare tactics about the swine flu." The difficulty for schools is letting students know about H1N1 risks without spreading panic, said James Tinney, director of media relations at Washington State University. "I think students have gotten the message. A lot of the students interviewed by the media outlets, their message back has been 'This is over-hyped. It's not that big of a deal.'" Earlier this month, the university had more than 2,600 possible flu cases surface. By Monday, WSU's flu blog reported that health services were in contact with 32 students with flu-like illness. Officials at Stillman College in Tuscaloosa, Alabama, canceled its first home football game because several players had flu-like symptoms. After that forfeit, the team played the next two games. But for most universities, events and classes have continued uneventfully. "National, state and local health officials have told us there is no reason to cancel events at Cornell," Claudia Wheatley, director of the Cornell press relations office, wrote in an email. "The vast majority of our students are very healthy and anxious to enjoy our traditional fall activities, like football games and so on." For two weeks, the school's InterFraternity Council canceled large social events out of health concerns. "Too often, as college students, we think we're invincible," said Cornell senior Eddie Rooker, president of the InterFraternity Council. "I think people are understanding how serious their health is and how their actions can affect their peers."